This is the second part of this weekends trip to London (the first was wandering around Tower Bridge). After an unsuccessful trip to Forever 21 on Oxford Street (unsuccessful because they don’t have a men’s department!) I wandered my way through Holborn and Fleet Street and stumbled upon St Paul’s Cathedral. I’ve seen quite a few cathedrals on my travels to Rome, Barcelona and this summer Milan and while St Paul’s lacks the grandeur of the Sagrada Familia or the Duomo, that doesn’t mean it’s not a beautiful building. Apparently both towers were supposed to have clocks. The statue outside of St Paul’s cathedral is Queen Anne. I went to the Millennium Bridge which didn’t strike me at all. I’m not sure what I was expecting to be honest. I remember when it first opened there was a problem with it wobbling and it was synonymous with the opening credits of The Apprentice. One thing I did like about the Millennium Bridge was the many padlocks hanging from it left by those in love (rather sweet, I should have taken a photo). I saw a great photo today of the bridge at night when it is colourfully lit up so maybe shooting it at night time will change my perceptions of the bridge. Fast forward a few hours past my visit to Tower Bridge, I made my way along the River Thames and ended up at Waterloo Bridge. I found this bridge only a few weeks ago but it’s one of my favourite places to take photographs from already. On one side you have The London Eye and Big Ben, whilst on the other you have The Shard and St Paul’s Cathedral. 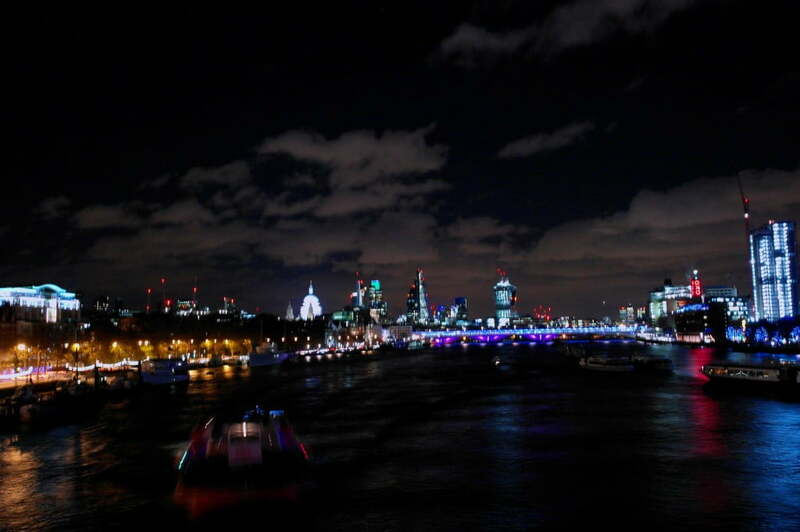 Previously I had visited Waterloo Bridge during the day, but by night it’s even better. It was about 6 o’clock and I was really struggling with the slow shutter speed to compensate for the dark – I’ve had to tweak both photos below. Here is the view from both sides of the bridge. I then walked along the Southbank Centre. Again, I had only been during the day but by night it took on a different atmosphere. 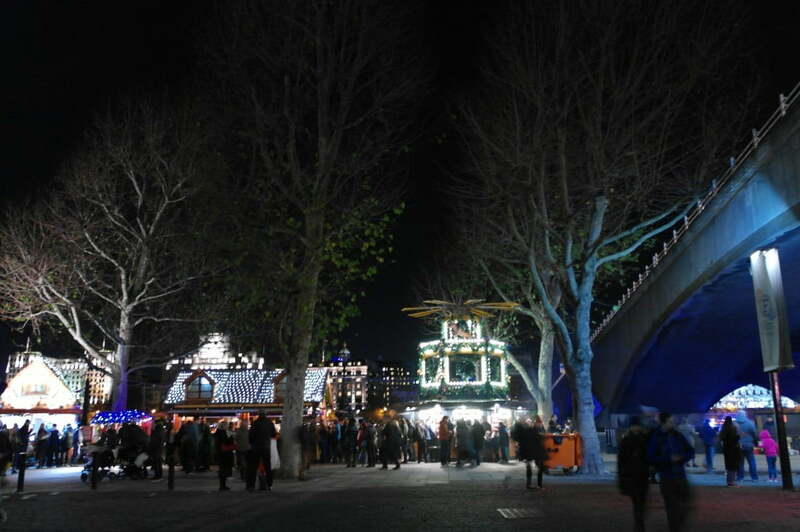 The little huts and wooden structures looked great all lit up. As soon as I walked down the stairs from Waterloo Bridge I was greeted with this sight. The London Eye stands out from anywhere like a blue beacon of light. They had matched a line of trees with the same colour to create a blue wonderland. I also had to edit this photo because the blue was overpowering just too much! But I do love how it has spread to the building next to it. I must have taken around 50 photos of Big Ben from different distances but just couldn’t get the clock face to show whilst having everything else in frame light enough to be distinguishable. But I actually like this photo where it appears the sky is black. 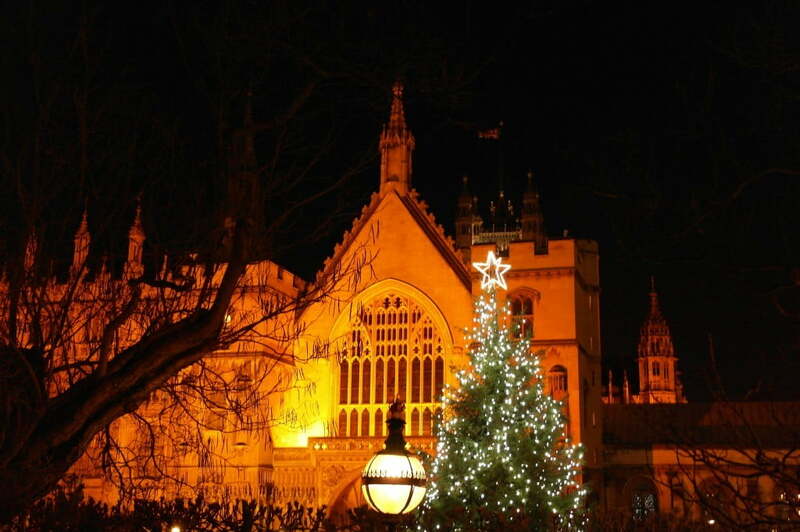 This is a lovely Christmas tree not far from Big Ben. I think I just like the glowing star on top! While I had no real objective for this trip to London, I did want to see the Christmas tree at Trafalgar Square. I learned a couple years ago that the tree is a gift given from Norway every Christmas – a lovely tradition I think you’ll agree. While it isn’t as pretty as the Christmas tree I saw in Lapland, the backdrop of The National Gallery is unbeatable. I pass this place (I think it’s Lancaster House based on Google maps) on my way back to London Victoria station and love how the arches and balcony are lit up. I love it even more with the Christmas tree! 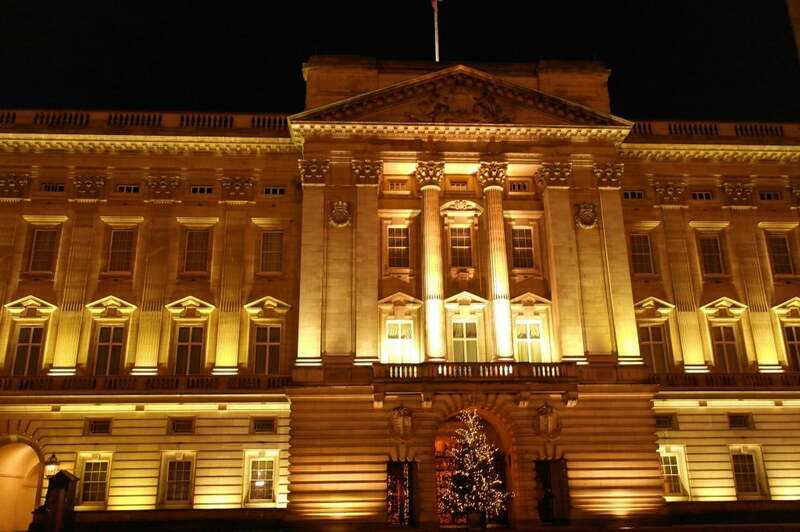 And finally, my last photo of the weekend was taken at Buckingham Palace. Buckingham Palace does nothing for me ( I can’t put my finger on it) but as I seem to love Christmas trees, here is one outside the Queen’s house. 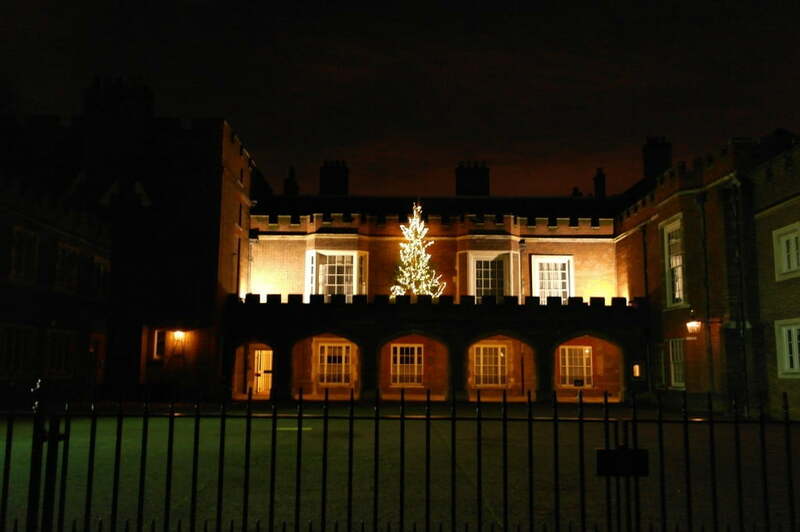 Where in London is your favourite Christmas tree? Where is your favourite place to take photos of London? Tell me in the comments section below!